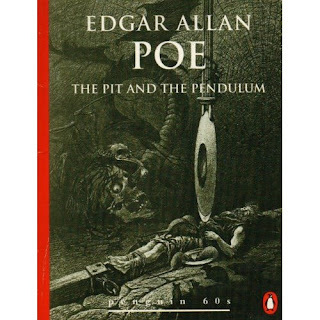 It seemed appropriate that I should read The Pit and The Pendulum today as on this day in 1849 (Oct. 7) Edgar Allan Poe died in mysterious circumstances in Baltimore in the Washington College Hospital. I have read several of Poe’s Tales of Mystery and Imagination and so far had not found them to be too scary. I had come to the book with great expectations that I would be terrified, so to some extent it was a relief to find that the tales did not freeze my blood, although I do think they are gory and sickening. Today I have changed my mind, now that I’ve read The Pit and the Pendulum. The horror continues as he cautiously examines his prison and only by luck avoids falling into a pit at the centre of the dungeon. The mental torment piles on him at the thought of the means of his death, and the hideous torture awaiting him. Exhausted he then sleeps and on waking finds the dungeon lit by a ‘wild, sulphurous lustre’, a pitcher of water and a loaf within his reach. The water is drugged and on waking again he finds himself bound head to foot on a low framework of wood, a pendulum suspended over him swinging and slowing descending towards his heart. He is left for hours to contemplate the result of the pendulum’s descent and then becomes aware of rats swarming around him, ‘wild, bold, ravenous – their red eyes glaring upon’ him. I think my reaction to this tale is partly because of my own fear and panic at waking in utter darkness and breathless, but is also due to the tension and suspense Poe has instilled into the text. I did anticipate the ending to a certain extent, but not completely, so that was a plus as well. The Poe Shadow, by Matthew Pearl gives a fictional account of the mystery surrounding Poe’s death, based on the historical facts. I read this book some months ago and although I think it is too long and tedious in parts, it did trigger my interest in Poe, as did a more entertaining novel, The American Boy, by Andrew Taylor, which is based on Poe’s childhood. For more information on Poe, go to The Poe Society. I also found Ed’s post Poe’s body claimed by Philadelphia at The Bibliothecary Blog very interesting. He has written a piece calling for the exhumation of his body to ‘translate his remains’ from Baltimore to Philadelphia, where Ed maintains he belongs. I read this ages ago and still remember it. That is an appropriately evil looking bookcover! That cover looks tempting enough!Poe’s language sometimes gets tad carried away. But I still like to read him. You are a wonderful writer! I can’t help but wonder when I read Poe’s work, what was going through his own mind that took him to that place! Thanks everyone. Kristen, Poe’s mind must have been a fearsome place.